The Einar by Darksword Armory was one of the first swords that marked a turning point for this company as they transitioned into higher end swords. 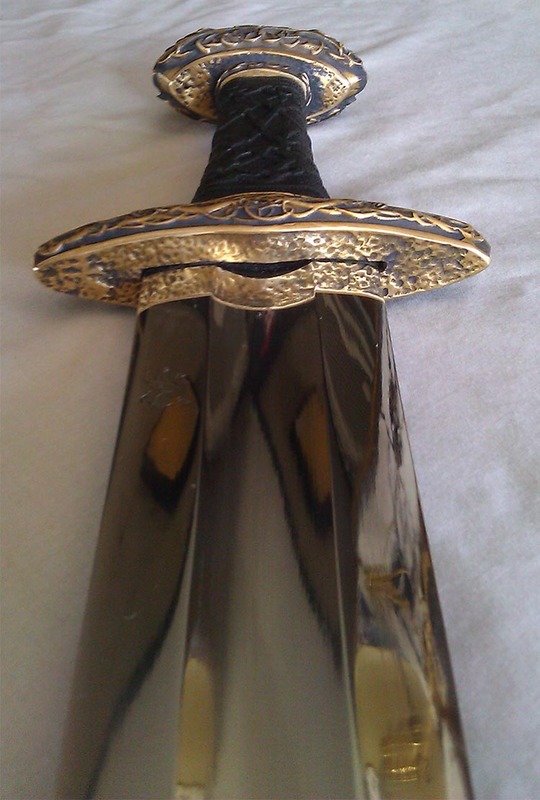 An inspirational fantasy piece, it is none-the-less not completely without historical precedent, as the Vikings did indeed love intricate, highly decorated sword hilts and the blade is unmistakably an Oakeshott Type X - the classic transitional Viking sword. But what does it actually look like in person? Read this review and find out for yourself.. I purchased this sword on Oct 10. 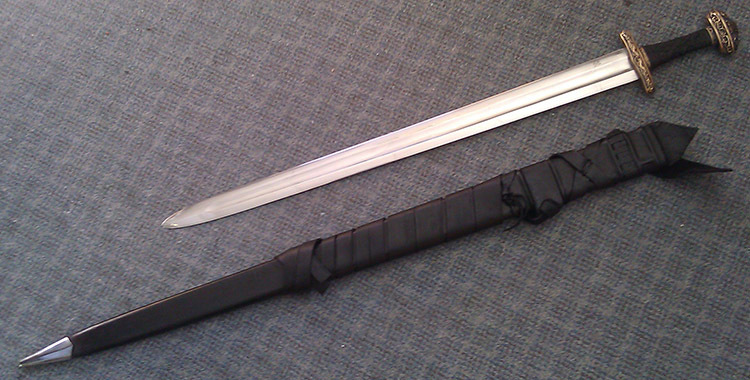 The sword, arrived on Nov 12. Upon opening the box I was at first a bit dismayed that there was almost no packing inside. However do to the fact the sword was shrink wrapped to the scabbard It arrived undamaged. As to the sword. Upon first glance it was everything I had hoped it would be. When comparing the sword to the sales add pictures its the same sword, although the amount of polishing is not as extensive on mine. 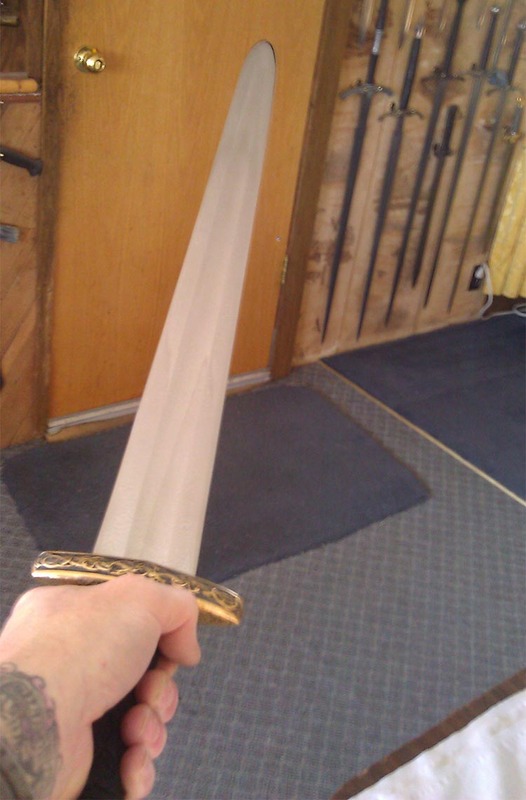 For all practical purposes: what you see in the photos is what you get with this sword. 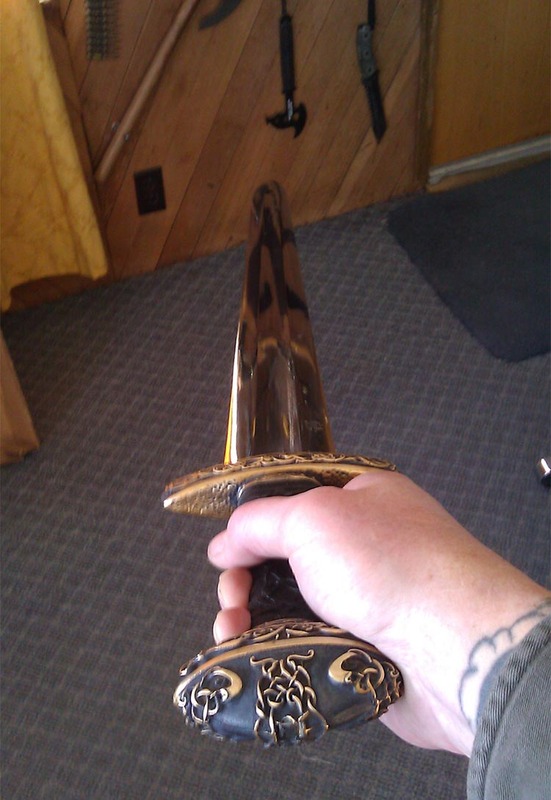 Historical note: This is a period influenced sword that based on a historically appropriate blade from 9-10 century and a hilt that is not an exact duplicate but representative of what one might find on the hip of a very wealthy Viking chieftain of that time period. As I said above the initial impression was not only that this sword is as it appears in the sales add. Its also the best thing that DSA has ever produced. 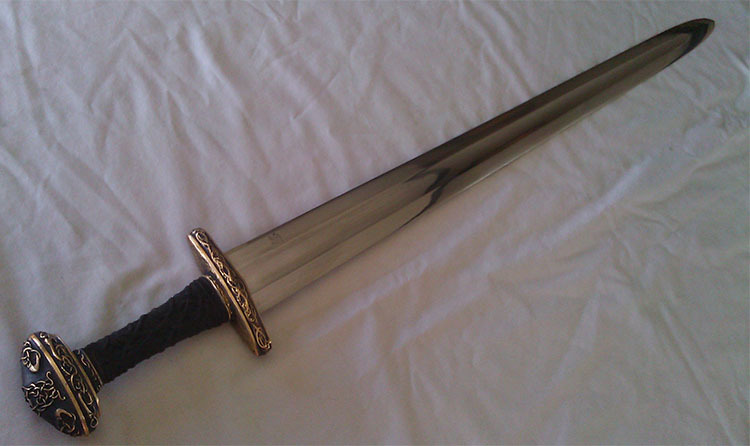 It has all the features that I believe most are looking for in a Viking sword. A beautiful blade with all the correct geometry. 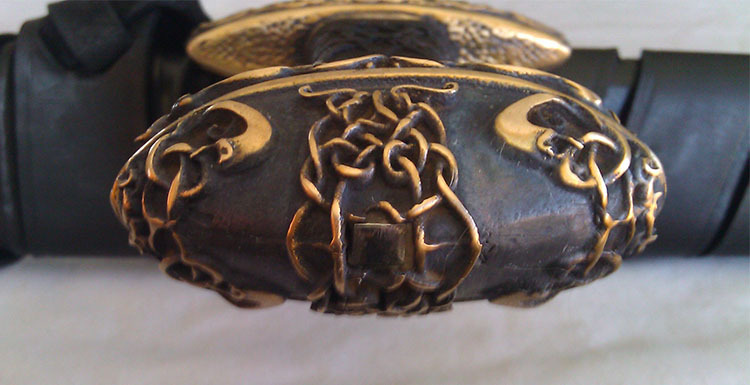 Highly detailed solid bronze pommel and guard. All combined to produce a sword with great looks and handling. Grip length: 4 3/8" including grip rings. Blade thickness: at base .23"
5160 spring steel dual tempered. 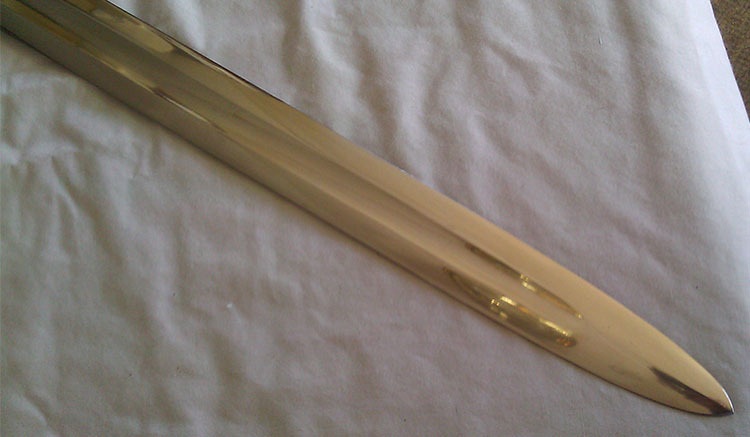 The blade is polished to a mirror finish. With an extremely smooth surface and only the slightest amount of ripples evident at the bottom of the fullers. 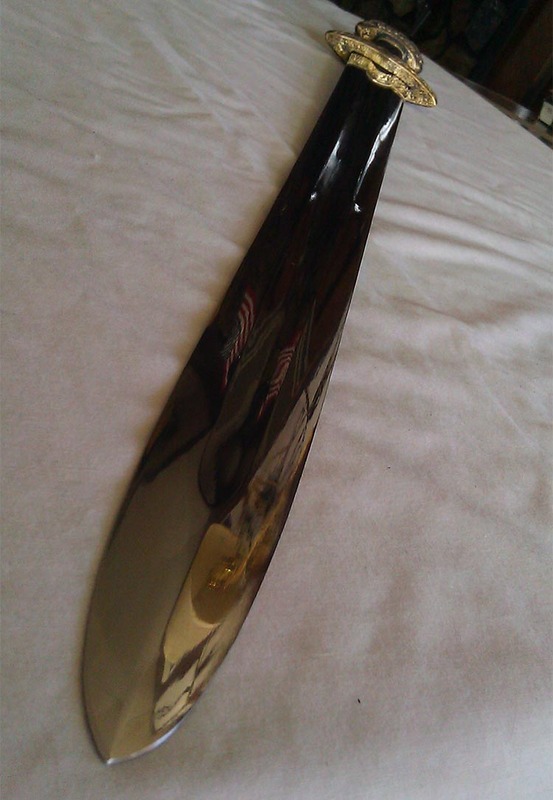 The fullers are very even with matching tapering lines that terminate smoothly and evenly on both sides of the blade. This blade is made in such a way that its edges terminate in a very nice Appleseed edge that is just less than paper cutting sharp around the entire edge with only a slight secondary edge at the last inch of the tip. While flexible this blade is thick enough that it is not at all whippy. And terminates in smooth spatulate point. 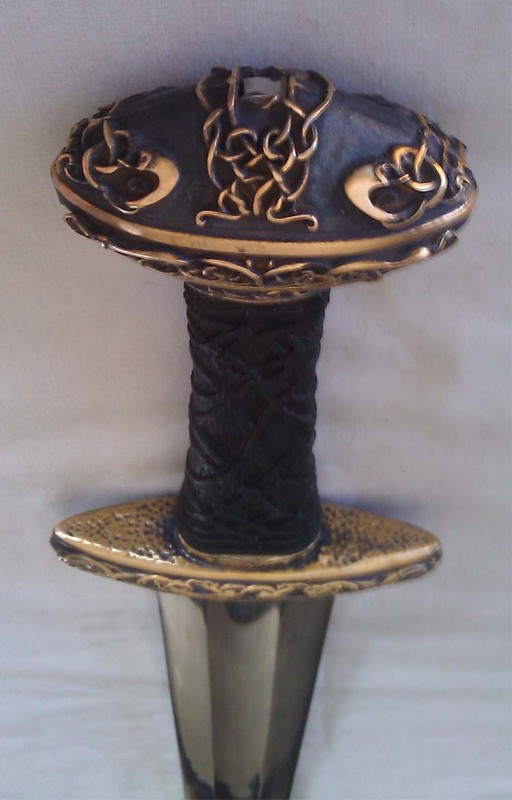 Although large, the solid bronze pommels dimensions fit the overall size of the sword, and provides the necessary counterbalance to the blades weight. The intricate detailing is beautiful and coupled with that of the guard provide a very rich look to this sword. Also of solid cast bronze the guard has a smooth surface on the grip side and with its detailing completes the look. As stated above the pictures of this sword on the sale page is, minus some small amount of detail the same as on the actual swords. Per DSA this sword has a hot peen. As far as I can tell it appears to be so. 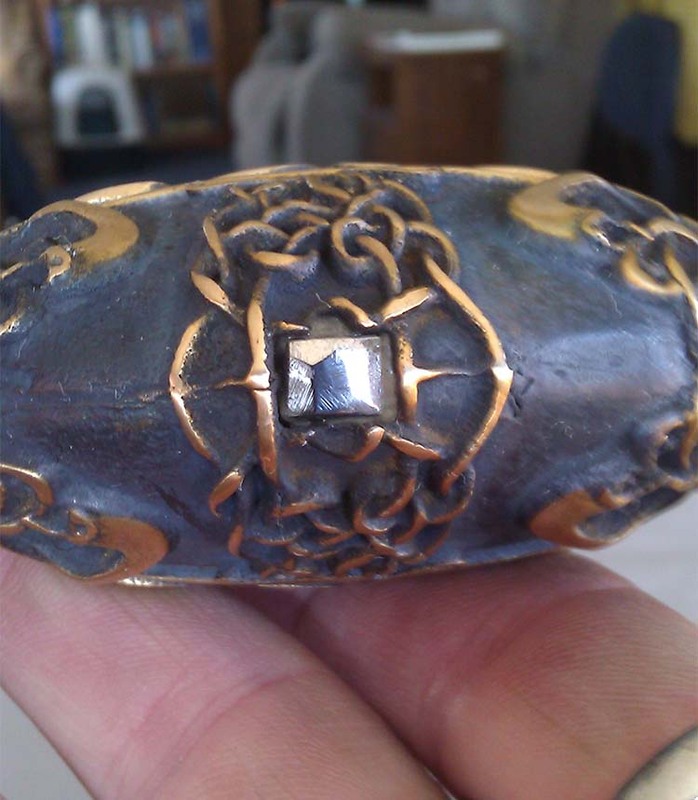 It is OK to look at with only minor grind marks, and the fact that the steel is a different color than the bronze pommel. I almost forgot to include this very important section. In my opinion on this sword the grip adds to the overall look of the sword in a very positive way. The overall shape and look, especially the carving go together very well on this sword. How ever all its good looks are far outweighed by its total lack of user ergonomics. It is to small in diameter, its is IMO tapered in the wrong direction for this type and it is very rough and coarse in the hand and a person can tell how much control is lost do to the poor grip design, it is just plain painful to hold. And yes "I do have sissy indoor work hands"
Was about 8" too long and not fitted to the sword. Basically a non starter for this sword as many swords even at this price come without scabbards. I have minimal experience with viking swords. But the overall feeling I get from this sword is that it is quite well balanced, with a strong blade presence. That seems to be prevalent on all my Viking swords. It is easily controllable and one feels like this sword is very ready in the hand. Able to provide strong slashing blows and some thrusting when needed. I really love this sword. Until I can afford a full custom this sword now holds a place in my heart as my hands down favorite. I love the way it looks, the way it handles, in fact I have had a hard time putting it down since it arrived. Just to be clear I would definitely buy this sword again. If you like Viking swords and also like swords that are not just period perfect copies then I think you would like it as well. Yes it is pricey but in my humble opinion it is more than worth it even without a scabbard. It's not for everyone and I will have to wear glove to use it. But I like the way it looks enough that I won't change the grip just for comfort. The price for the Einar varies from $705 to $805 plus shipping depending on whether you order it with the upgraded scabbard and/or with sharpening service. However, if you buy it here at the SBG sword store, like with ALL Darksword Armory swords we stock, it will come with the deluxe scabbard at a reduced price plus free sharpening and free shipping for the best package at the best price.. In this case $784.99 for the works saving you around $60.